Quang Nam authorities discovered an inter-province wildlife trade ring and seized many animals on October 29. Pangolin found on the bus. The police collaborated with the forest rangers in Dai Hong Commune to pull over and inspect a passenger bus which was going from Dak Lak to Hanoi. The bus was carrying many animals including five Sunda pangolin in plastic baskets. The baskets were hidden in secret compartments on the front sides of the bus. The driver, Nguyen To Giang, admitted to having been hired as a transport man for Truong Thanh Phuoc, 34, from Kon Tum Province. On the same day, the police worked with border guards at Nam Giang Border Gate to arrest Phuoc. 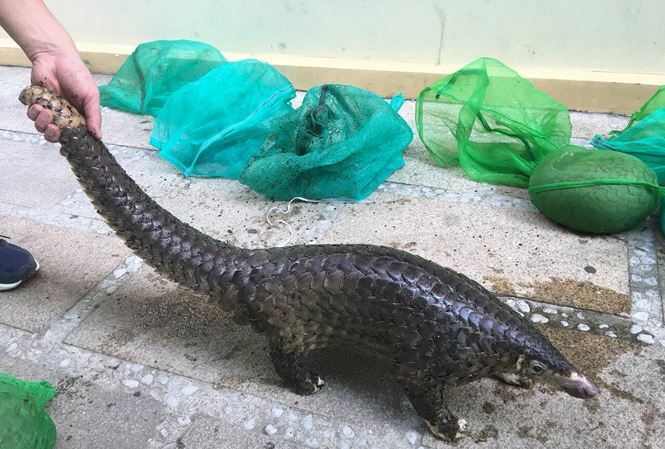 He admitted to buying pangolin from the locals in Kon Tum Province and was planning to sell them in northern provinces. As the investigation continued, the police searched Phuoc's house and his farm in Danang City and found 13 Asian palm civet and seven Asiatic brush-tailed porcupines. The police have expanded the investigation./.